Getting around Prague by public transport is easy, efficient and cheap. Taking a taxi is a good idea when you’re travelling with a lot of luggage, long distance or at night when the metro isn’t running. 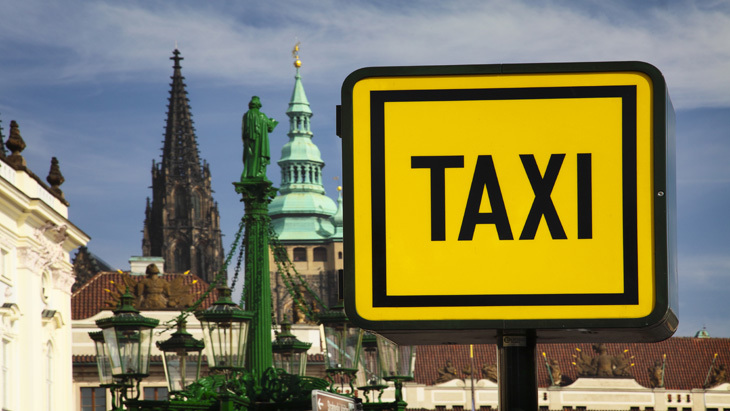 However, when taking a cab, be cautious not the get scammed, because taxi drivers have a bad reputation in Prague. There are a few things you can do to try to avoid being ripped off. One of the ways to ensure that you’re getting the best service is to take a taxi from the “Fair Place” stands, that are set around the city. According to Prague Information Service this information is up-to-date, however, prices may rise throughout the year. In addition to fixed prices, the taxis which use “Fair Place” have to comply with certain guidelines - the taxi must be equipped with a permanently roof light with the TAXI sign, company name, registration number, and basic rates must be displayed on both front doors. The displayed prices must match those on the taximeter. However, in case you find yourselves not near one of the “Fair Place” stands the best thing to do is to call one of the non stop dispatching services, which will inform you about the total fare in advance. When the journey is completed, the driver is obliged to issue a fully filled receipt for the payment, which has to be issued by the taxameter printer. In case you don’t have the number of any of the taxi companies, here is the list of the taxi companies that the Prague City Council considers reliable. In case you’re travelling from/to the airport, the most reliable taxi service is Prague Airport Taxi which offers low cost airport transfers, fixed prices and English speaking drivers.